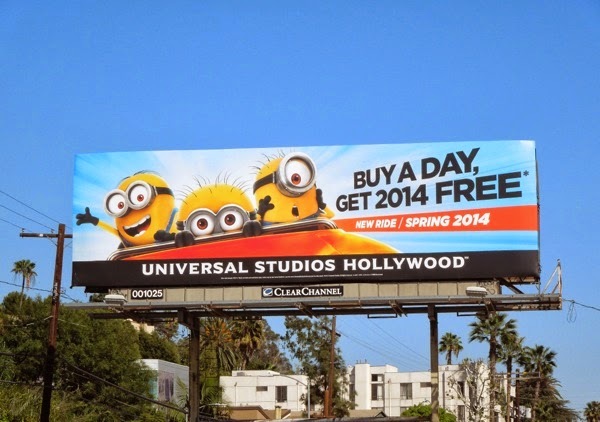 Fans of the Despicable Me movies and those lovable Minions will be delighted to learn there's a new ride arriving in Universal Studios Hollywood this Spring 2014 (although visitors to their Florida park may have seen it already). 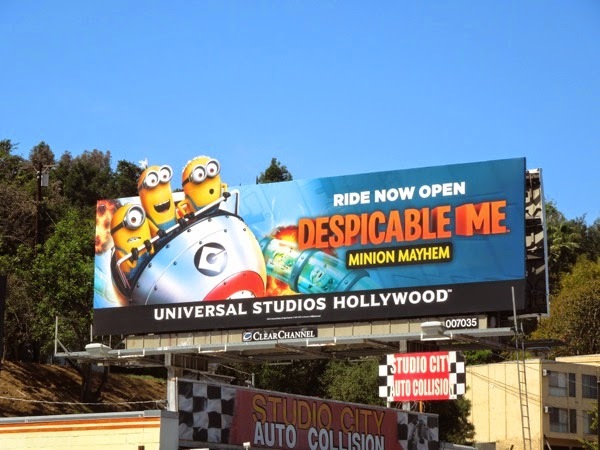 The theme park is obviously capitalising on the box office success of the two computer-animated movies starring Steve Carrell as the reformed criminal mastermind 'Gru' and his pesky yellow henchmen, plus this new movie motion simulator ride also provides a much need refresh to the attractions on offer at the L.A. based park. 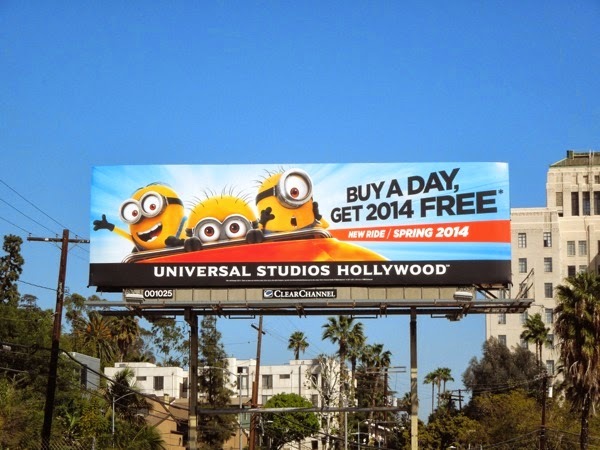 These Universal Studios Hollywood billboards featuring three of the Minions were first spotted along Santa Monica Boulevard on February 14, and a month later along Highland Avenue on March 15, 2014. Daily Billboard wonders how long it'll be before this fun new ride gets the special installation treatment to promote it, as Universal Studios Hollywood usually debuts new attractions in the first year with standard landscape billboard campaigns and then follows up with something special the following year, like these King Kong 3D mannequin billboards and special Transformers ride billboard from previous years. 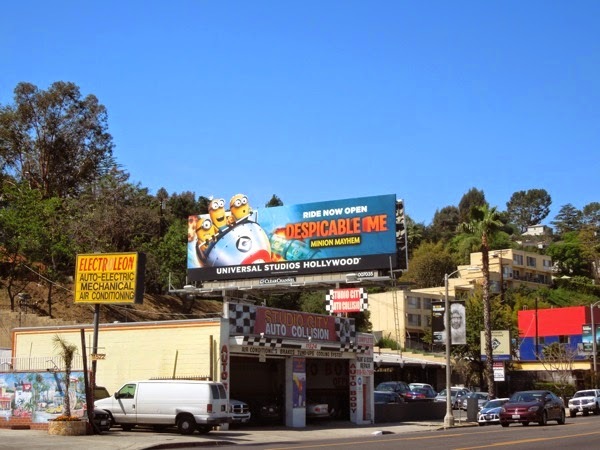 Plus if you're a fan of the movies, be sure to also check out these fun Despicable Me 2 movie billboards from around L.A. last year. 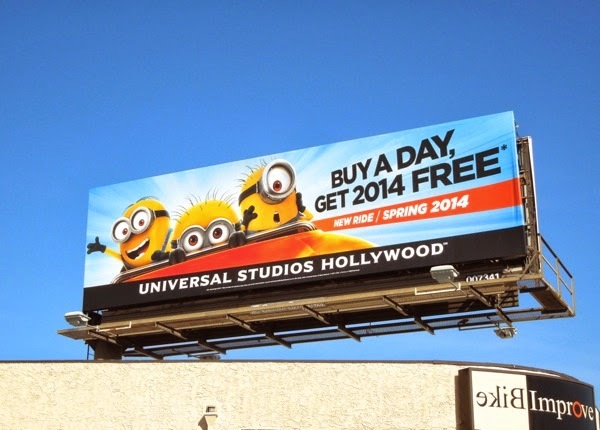 UPDATED: Now that their new ride is open at Universal Studios Hollywood, here's a new special extension billboard dedicated to promoting the Despicable Me: Minion Mayhem simulator attraction. 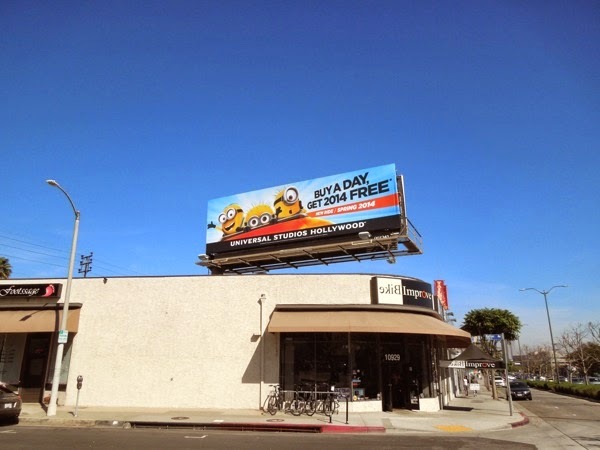 Daily Billboard is sure this fun ad spied along Ventura Boulevard in Studio City on April 14, 2014, will have kids pestering their parents to take them to the theme park in no time at all. 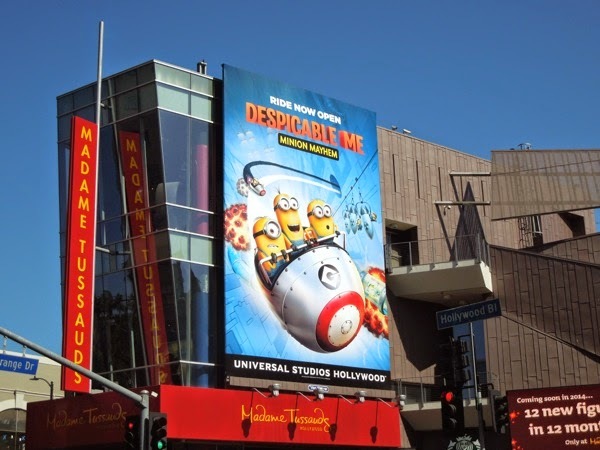 In addition here's a super-sized version of this colourful billboard creative snapped at Madame Tussauds Hollywood along Hollywood Boulevard on June 3, 2014.